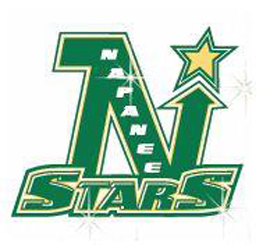 The Napanee Peewee BB Stars reached the semifinals at the Northumberland Regional Silver Stick in Cobourg. Barrie proved to be their nemesis as they defeated the locals 6-1 in round robin, and 5-0 in the semifinals. To reach that game, they outscored Pickering 4-1, and Quinte West, the eventual winners, 5-3. – The Novice BBs also took part in the Cobourg Silver Stick, defeating New Hamburg 2-1, but losing 4-1 to Stirling and 3-1 to Kanata. Mason Whalen scored in the Stirling game, while Keagan York tallied twice facing New Hamburg, and also scored in the Kanata match. – In league play, the Midget Stars controlled Loyalist 7-3 Friday on the road, and 6-0 at home to run their perfect league record to 14-0. Saturday the Stars got goals from Ryan Kirkpatick (three), Oronhyathe Green, Josh Cudd and Kyle Garrett. Goalie Emerson Kennelly earned the shutout, and a rare assist on Green’s tally. – Meanwhile, the Exit Realty Acceleration Bantams travelled to Tweed and were outscored 6-4. They are presently third behind Frontenac and Tweed in league standings. – The L&A Mutual Insurance Peewee AEs lost to Loyalist 6-4 on Friday. Carter Slaven scored twice while Noah Nugent and Nate Van Berkel chipped in singles. Saturday the locals earned a 5-2 win hosting Stirling. Ryan Maracle had a pair of goals, while Coulson South, Noah Nugent and Owen Kish netted singles. Sunday in Campbellford they fell 9-2. – The Atom BBs got a scare in Picadilly facing Frontenac, but managed a 4-3 win. Sunday, they faced Tweed and coasted 15-1. Goal scorers in that one were Evan Gaffney (three), Ben Kerr (two), Sophie Frazer (two), Malcolm McCaw (two), Kohen Cutler (two), Wyatt Albright (two), Kolten Lockridge and Lucas Asselstine. Caleb Scrimshaw patrolled the crease. – The Atom AEs played three solid matches last weekend, edging Lakefield on the road 4-3 Friday. Saturday in Douro, they were 6-1 winners. Finally, back home on Sunday, they mastered Stirling 4-3. Wesley Davey, Peyton Brooks, Cruz Maracle, and Brock Alaver did the damage for the Stars in the Sunday match.